The beautiful table and mirror frame Jeff O'Brien built for me were top notch in design, materials, construction and finish. They arrived on time and in perfect condition. The six month lead time was a bit worrisome, but the results were flawless. I would not hesitate to work with Jeff again. 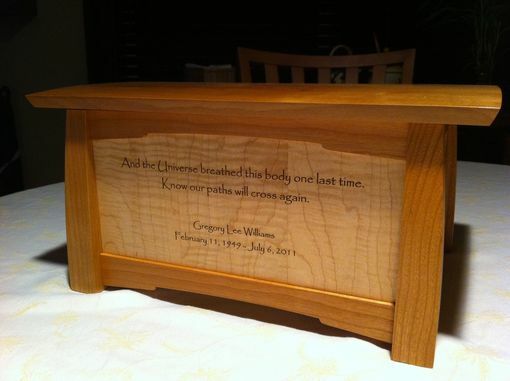 This box is what I call a remembrance box. 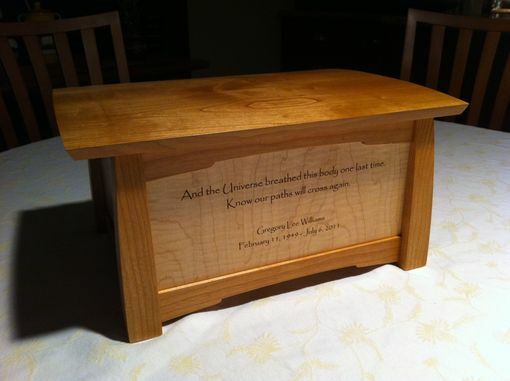 It could be used for many things, in this case, it's being used as an urn. This one is made of cherry with curly maple panels. The top is removable and could have hinges. Dimensions: Varies, this one is about 12" x 8" x 6"
Every maker has a story. Be a part of Dogwood Design's story by placing an order, leaving a review, and seeing your review appear here.